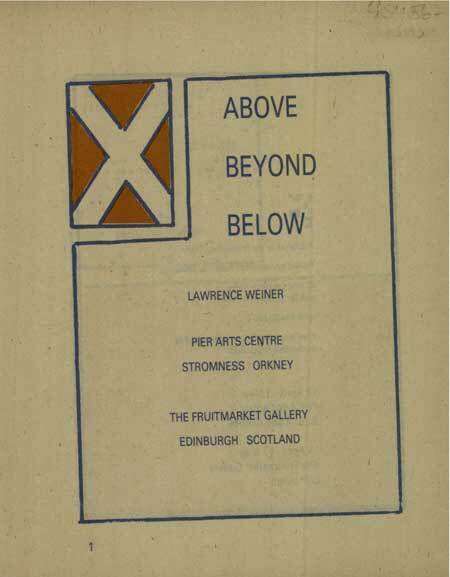 An Artists' book / exhibition catalogue published in conjunction with exhibition held April 12 - May 3, 1986, traveling to Pier Arts Centre, Stromness, Orkney, April 19 - May 17. Texts by Erlend Brown and Mark Francis and design and projects by Weiner. Reference: Catalogue No. 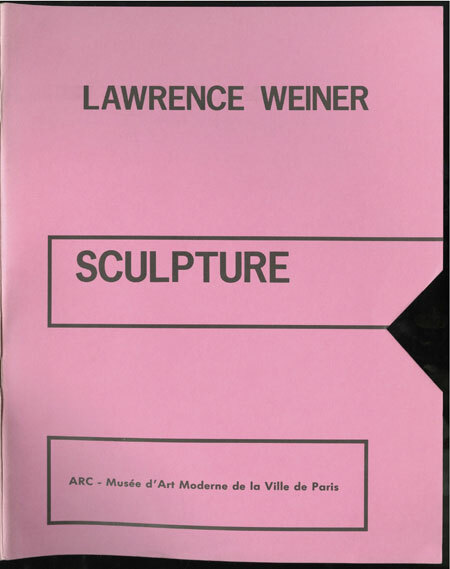 25 in Dieter Schwarz, "Lawrence Weiner : Books 1968-1989, Catalogue Raisonné," Verlag der Buchhandlung Walther König, Köln, Germany, and Le Nouveau Musée, Paris, France, 1989, pp. 102. * 17.5 x 14 cm. Exhibition catalogue published in conjunction with show held June 27 - September 22, 1985. Contains interview conducted by Pagé, which serves as the catalogue's primary text. Catalogue design by Lawrence Weiner. Printed in black-and-white. Text in French and English. * 26.5 x 21 cm.